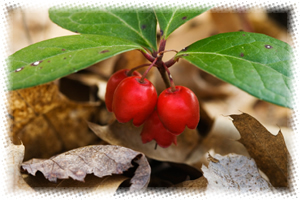 What is Wintergreen Oil ? Wintergreen is a powerful and useful oil that I have used with success as a topical analgesic on my tough arthritis pain. Because of the toxicity of methyl salicylate, many aromatherapists do not recommend it's use. However as long as you are not sensitive to salicylates, ( I am not, thankfully since I have arthritis), and you can use it with a dose of common sense and respect for the herb. Very potent skin irritation. Keep out of reach of children. For external use only. Dilute properly; Avoid if pregnant. Warning: Harmful or fatal if taken internally. As little as one teaspoon can be fatal if ingested by a child. Use sparingly,as the active phytochemical, methyl Salicylate is toxic in large doses. Flowers:White, small, usually solitary, nodding from a leaf axil. Corolla rounded bell-shape, 5-toothed; calyx 5-parted, persistent; 10 included stamens, their anther-sacs opening by a pore at the top. Stem:Creeping above or below ground, its branches 2 to 6 in. high. Leaves: Mostly clustered at top of branches; alternate, glossy, leathery, evergreen, much darker above than underneath, oval to oblong, very finely saw-edged; the entire plant aromatic. Fruit: Bright red, mealy, spicy, berry-like; ripe in October. Omnivorous children who are addicted to birch-chewing prefer these tender yellow-green leaves tinged with red, when newly put forth in June - "Youngsters" rural New Englanders call them then. In some sections a kind of tea is steeped from the leaves, which also furnish the old-fashioned embrocation, wintergreen oil. Late in the year the glossy bronze carpet of old leaves dotted over with vivid red "berries" invites much trampling by hungry birds and beasts, especially deer and bears, not to mention well-fed humans. Coveys of Bob Whites and packs of grouse will plunge beneath the snow for fare so delicious as this spicy, mealy fruit that hangs on the plant till spring, of course for the benefit of just such colonizing agents as they. Quite a different species, belonging to another family, bears the true partridge-berry, albeit the wintergreen shares with it a number of popular names.